The Trump administration is issuing late warnings that its rollout of a new program to streamline and expand access to private sector health care will be a bumpy ride. The Veterans Affairs Department has entered crunch time as it prepares to implement the VA Mission Act, which President Trump signed into law in 2017 to consolidate existing private care programs and make it easier for more veterans to access those providers. The measure was easily approved in Congress along bipartisan lines, but has since faced partisan pushback from detractors who claim the administration is attempting to privatize VA health care. The new standards are expected to go into effect in June. Democratic Rep. Mark Takano, Calif., and Sen. Jon Tester, Mont., the respective chairman and ranking member of their chambers' VA committees, led a group of 55 Democrats in voicing their concerns with the proposal. They predicted the standards would shift an outsized portion of VA’s resources away from the department’s own facilities and toward private care that would lead to a “hollowing out of VA facilities.” The lawmakers also accused VA of failing to consult stakeholders during its deliberations and leaving open the possibility that a veteran receives VA-funded care without ever seeing a VA doctor. On Wednesday, Tester further said VA is at risk of sending patients out for private care that is lower in quality and less timely. He praised the administration for working “hand in hand” with Congress while it was drafting the Mission Act, but said it has since lost his trust as it pursued a political agenda. “Since the Mission Act was signed into law I’ve had concerns the VA’s primary focus could be on supplanting in-house care instead of supplementing that care when it makes the most sense for our veterans,” Tester said. 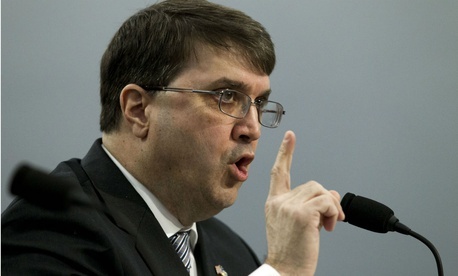 VA Secretary Robert Wilkie anticipated backlash prior to releasing the new standards, saying in a preemptive statement that some opponents of the department’s approach would “claim falsely and predictably that they represent a first step toward privatizing” VA. Richard Stone, the executive in charge of the Veterans Health Administration, told lawmakers on Wednesday that the process for creating the access standards was “not arbitrary” and took into consideration public comment. They were designed to “support VA’s goals of putting decisions regarding health care in veterans’ hands and making sure veterans have access to care when and where they are needed,” Stone said. He added the private sector is less transparent about its wait times than VA, but expects the department to be able to better inform its patients about how long they should expect to wait to see a doctor outside VA about six months after it launches its new program. Lawmakers pressed VA officials on whether they would be ready to deploy the department's consolidated community care program under the Mission Act by the June 6 deadline, highlighting new digital tools the department is developing to support that rollout. The U.S. Digital Service last month flagged those efforts as behind schedule and potentially delaying care. VA officials told lawmakers they are moving forward with those new tools, but conceded the department may have to make adjustments—both to its IT systems and the new private care system writ large—on the fly. Stone said while no errors will block VA from providing care on June 6, he could not promise that wait times would not be expanded during the initial rollout. Sharon Silas, acting director for health care at the Government Accountability Office, said the two biggest challenges remaining for Mission Act implementation are finalizing all the contracts for private sector care and completing the necessary IT systems. “We need to wait and see if they make the schedule for that,” Silas said. Sen. Joe Manchin, D-W.Va., said VA should not rush to implement a program that is not yet ready, while also faulting the department for creating arbitrary access standards. Kameron Matthews, VA’s deputy undersecretary for health for community care, said facilities throughout VA are staffing up and providing training to prepare for the Mission Act’s community care deployment. Department officials said VA does not expect a significant change in the percentage of veterans who opt for private care at the outset. VA currently has 49,000 vacancies, according to department data, up 7 percent since June 2018. The department has said it is now seeing a net increase in hires, but the overall number of unfilled jobs continued to climb due to turnover and workforce growth. VA’s 380,000-employee workforce is a 28 percent increase from 10 years prior and a 61 percent jump from 15 years ago.